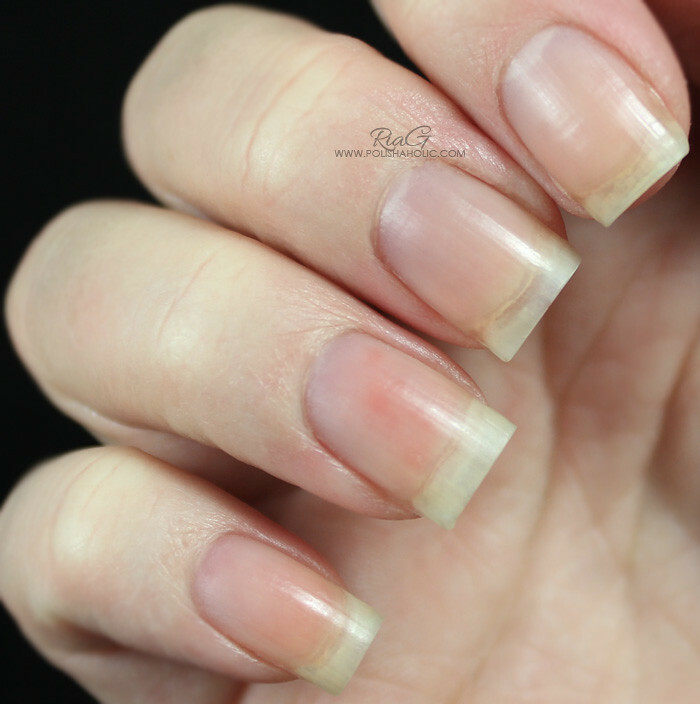 About 6 months ago I decided to get rid of my gel nails and grow my natural nails back. I removed the gel completely from my right hand nails and grew it out from my left hand nails. It was a long process and now I’m finally at the point where my nails are healthy and they are not peeling or breaking. During this nail growing project I found some new products that work great for me and also tested some that don’t work for my nails. At the moment my nails are growing fast but I’m keeping them at this length and not trying to grow them longer. Right now the perfect shape is more important to me than length. I also have 2,5 months old baby and weather is getting colder. So also for those reasons I’m not even trying to have longer nails. I’m quite happy with the way they look now. My nails feel strong and healthy and they are actually in the best condition they’ve ever been before. 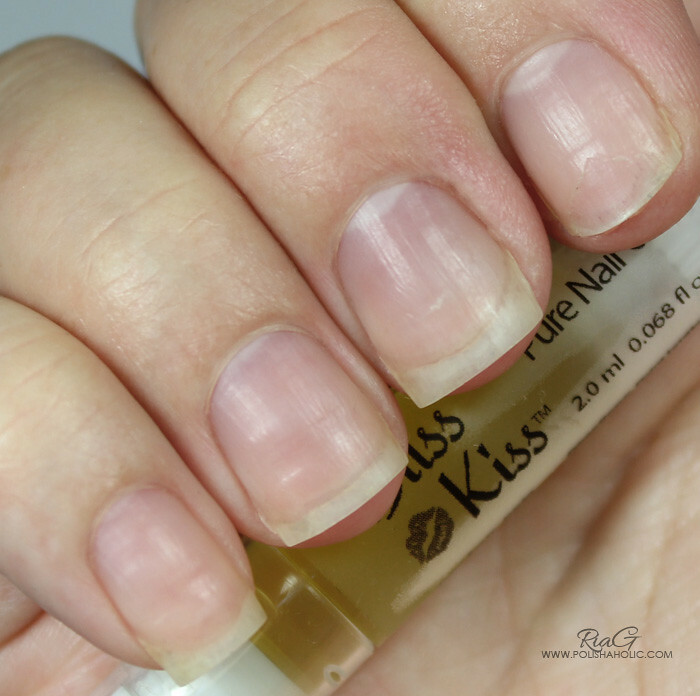 Biggest thanks I owe to Bliss Kiss Pure Nail Oil and nail care tips I’ve read from NailCareHQ.com. I’m working on a blog post about my current nail care routines and products I use so I’m not going to go in to details here. I just want to show you the results this time and the nail care post will be up soon enough. Yeah, I know. Looks like a mission impossible and if you thought that was bad, take a look at this next photo taken about a week later, right after nail polish remover. (Duri Rejuvacote was one of the products that did not work for my nails at all. It caused peeling and breaking which is what most nail strengtheners do for my nails).n. Dry, damaged, weak nails and horrible cuticles. I had a looooong road ahead of me growing these nails back to being healthy. I’m so very proud of myself for having the patience to do this and not go back to gel nails. 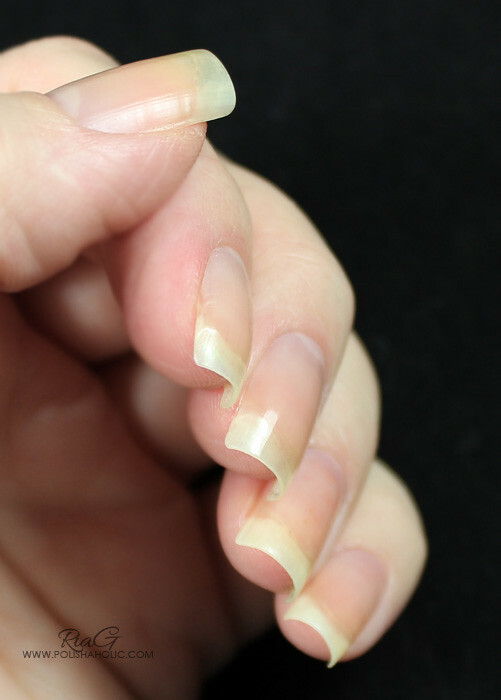 My nails are naturally very thin and they peel and break easily. Bliss Kiss and Ana’s nail care tips have changed everything for me. As I said earlier I have a post coming up soon about my nail care routines and on that post I explain how I keep my nails looking like this. *** I don’t benefit from clicking the link on this post. So here’s where I started from 29th of May. Ultra short nubbins damaged by removal of the gel layover. And here’s how they looked yesterday 15th of July. There’s still a tiny bit of the damaged part left on my pinky, ring and middle finger nails. 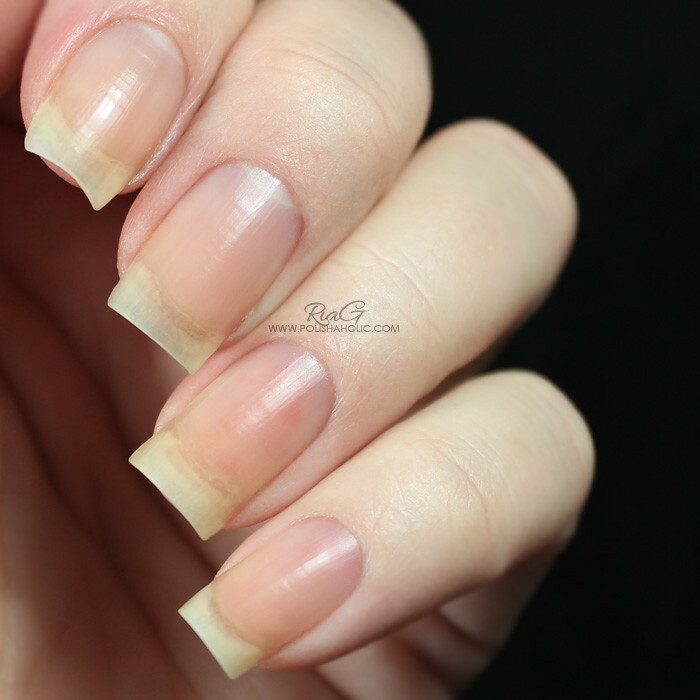 Another week of growing and then filing them shorter again should do the trick with those nails and then they are all my natural nails and all healthy. So let’s move on to the left hand. Here’s how the nails were doing 21st of June. And here’s the situation yesterday, 15th of July. So on the photo you can see about 3 weeks of growth. The gel layover is still perfectly attached and I’ll leave it be for now on. I keep filing these nails shorter once a week and now there isn’t a huge difference between my right and left hand nails. Both thumbs are in the same point with these ones. About half of the nail plate showing and the rest still has the gel layover on it. 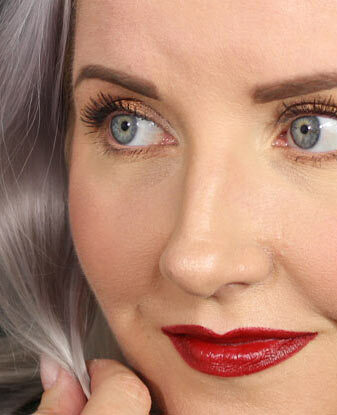 Then let’s talk a bit about the products I’ve been using. 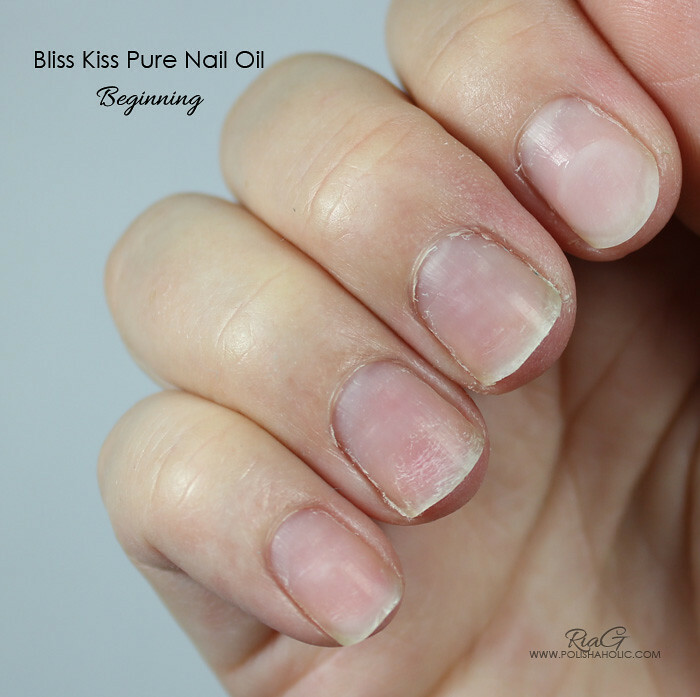 I’m still using Bliss Kiss Pure Nail Oil daily and my opinion about that hasn’t changed. It’s simply amazing and my nails love it! It has made the world of good for my cuticles and my nails always look nice and well moisturized. I have also been testing Duri Rejuvacote and I’m afraid it does the same to my nails as most nail strengtheners do, it makes my nails peel. If I use it for three or more manicures in a row my nails start to peel. I switched to Essie Nourish Me but that didn’t stop the peeling completely so I took a few days break from nail polish and just kept applying Pure Nail Oil several times a day. Then I filed off all the length and peeling parts and kept using the oil. Now I’m going to test Sally Hansen Nail Rehab treatment and see if that works for me. I’m really dying to find a good base coat/treatment for my nails. I always use Glisten & Glow Stuck On Blu! on top of the treatments, before the polish to prevent staining. I also like the sticky base it creates for the polish. So all in all the nail growing project is moving along nicely. I’m happy to have my natural nails back and very excited to see if I can find the right products to keep them healthy too. ***Bliss Kiss Pure Nail Oil and Essie Nourish Me were purchased by me. Duri Rejuvacote and Sally Hansen Nail Rehab were sent to me for free. 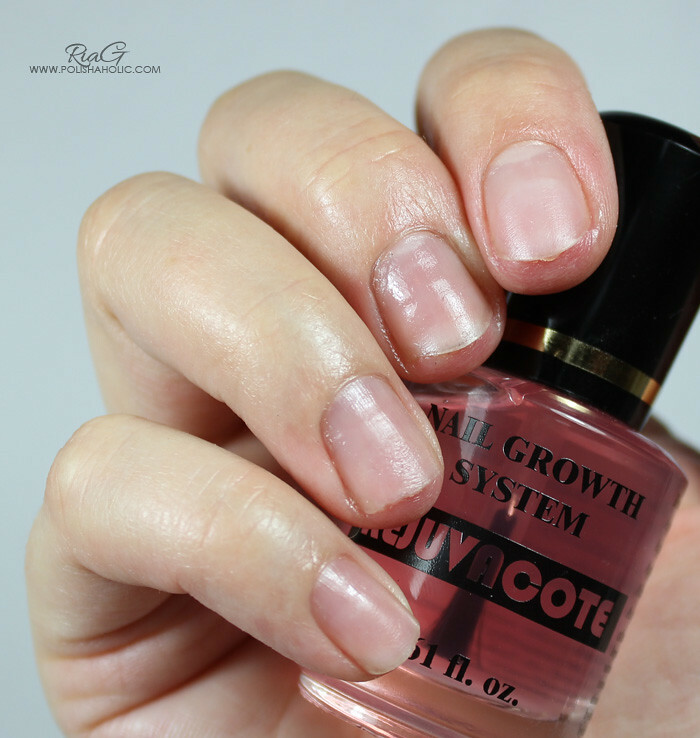 Today I’m going to show you how the nail growing project is going on my left hand. I still have the gel layover on my left hand nails and I’ll leave it be till it grows out or falls out, which ever comes first. I keep filing the length off once a week so I can keep them nice and short and have minimal stress on the gel layover. 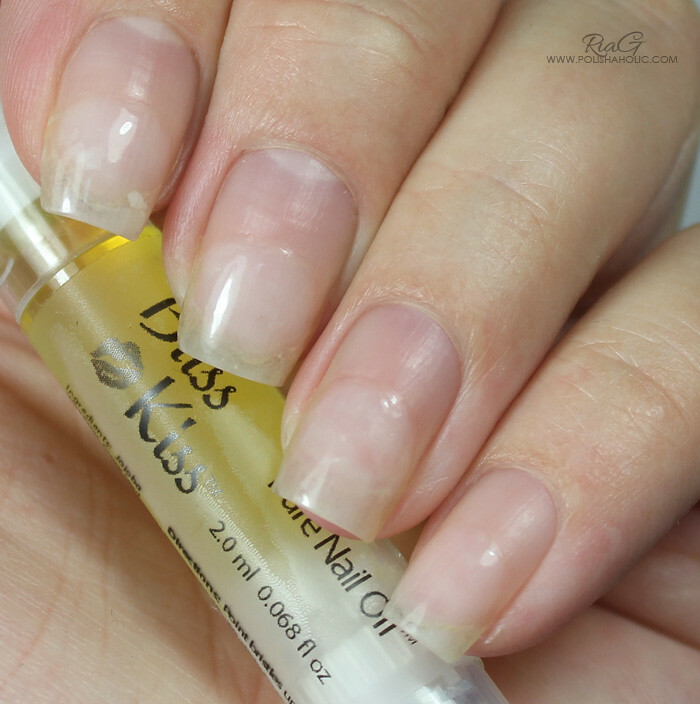 Two weeks ago I also received my Bliss Kiss Pure Nail Oil order and I’ve been using it ever since. You can see a nice improvement on my cuticles and the part of my natural nails that is showing is looking nice and moisturized too. This is most definitely the best nail oil I have ever used and there will be a whole post about it coming soon. So here’s the three week progress on my left hand. This first photo was taken June 1st. And this photo was taken today, June 21st. You can see a good amount of growth (could always be more and faster if you ask me) and I’m happy with the way things are going at the moment. So this is how my left hand is doing. I’ll have a post up about the right hand and one month growth next weekend. Next week I’ll also have a review of Bliss Kiss Pure Nail Oil for you plus some swatch photos of course! ***Kiss Bliss Pure Nail Oil purchased by me. I don’t benefit from clicking any of the links on this post.